wMobile interacts with your device allowing you to quickly phone and email contacts using the capabilities of the device. 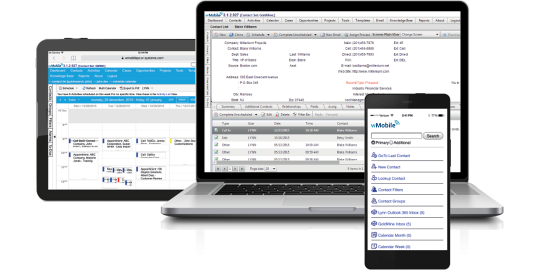 Users have full access to one or more email accounts and are able to manually or automatically link emails to contact records interaction history. wMobile provides a full web based email center for both the phone and desktop user interfaces. wMobile delivers an automatic email archiving service that allows your users to use any email client including their phones native client. Any email matching GoldMine contact email addresses will be automatically filed into contact history. wMobile supports all phone devices such as iPhone®, Android®, and Blackberry®. wMobile supports all worldwide mobile phone carriers and systems with internet data service. 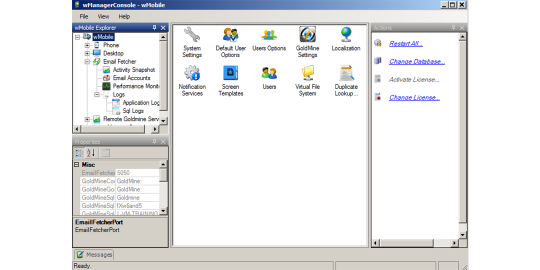 wMobile Desktop Edition supports desktop web browsers such as Internet Explorer, Firefox, Chrome and Safari on Windows and Apple computers. wMobile allows you to easily review, update and add sales forecasts or opportunities for any contact and for any time period. wMobile offers a variety of filtering mechanisms to make it easy to select opportunities of certain types closing in certain periods. 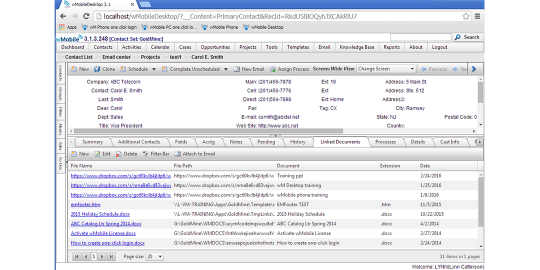 wMobile provides easy access to any document linked to the GoldMine CRM contact record. wMobile allows you to quickly review, update, add and complete activities with immediate update of your GoldMine database. Activities appear in both list and calendar format. 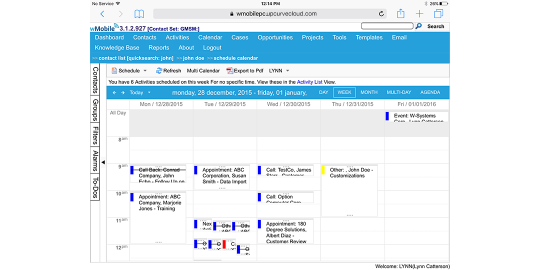 You can edit, reschedule, complete and review activities quickly from the list. 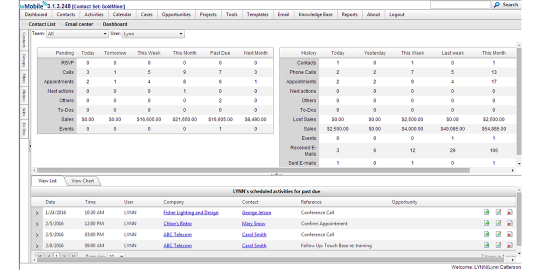 Dashboards are available in both Phone and Desktop versions, displaying information on Pending and History activities. Key metrics such as calls, meetings, and sales completed and emails processed are viewable for individuals and teams based on security rights. 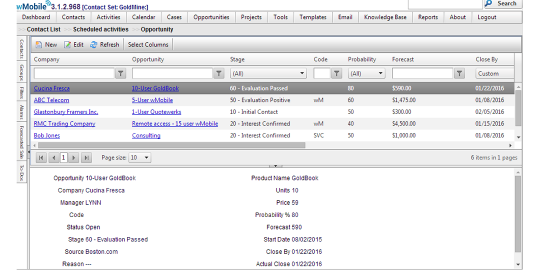 In the Desktop version, drill-down capability gives users a method to bring up lists of past due activities, today’s scheduled appointments, this month’s forecasted sales, closed sales for the month, new contacts, etc. Activities can be edited, completed, or deleted (depending on user permissions) from the resulting list. 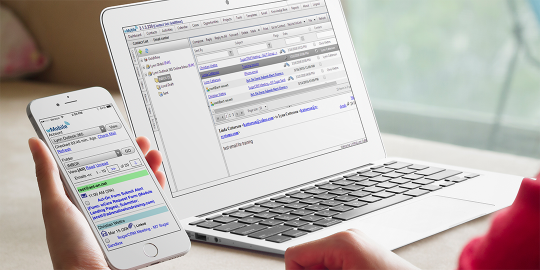 wMobile supports access to Crystal Reports on the phone and desktop web client. 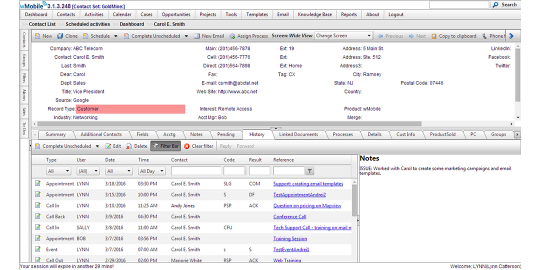 wMobile automatically inherits configuration from your GoldMine CRM system. Administrators have a central application to manage users, record access, wMobile system and user settings, email settings, notification settings, document access, and logs. A designer application is included to allow additional changes to the wMobile Phone home menu interface. Information updated on a wMobile device is immediately applied to your GoldMine system without the need for data replication, such as contact updates, completed activities, etc. These are immediately available to other users in GoldMine or on wMobile Phone or Desktop.